KC Grande Resort and Spa occupies the a prime stretch of beachfront on White Sand beach and provides some of the best accommodation in newly built hotel blocks and luxury villas. Worth splashing out for if you want to stay on White Sand beach. 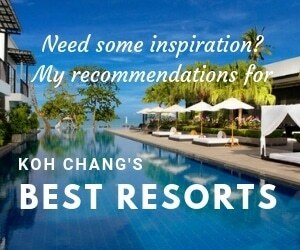 Why choose KC Grande Resort? KC Grande Resort and Spa occupies the best stretch of beachfront on White Sand beach. It’s one of the most popular resorts on the island. It’s also one of the largest. In total, there are over 200 rooms and villas. The beachfront ‘Seaside’ hotel blocks house the ‘Seaview Deluxe’, ‘Deluxe Garden’ and ‘Grand Delux Sea View’ rooms in a three storey block set back from the huge lagoon pool which opens directly onto the beach. Another smaller pool is located about 100 metres north near the beach villas. Although there are a lot of rooms, there’s also plenty of beachfront for kids to play on without getting under the feet of other guests. In early 2013 , two more hotel blocks opened situated on the inland side of the main road. These also have their own swimming pools – one being on the rooftop. A very nice spot to sunbathe or have a drink at sunset. It’s also usually quiet and with relatively few kids. In these blocks you’ll find the ‘Ocean View’, ‘Pool Access’ and ‘Pool View’ rooms. By the beach, just north of the main pool is where you’ll find KC Grande’s ‘Paradise Villas‘. If you want to splash out on a luxury beachfront bungalow then this is the place to book on Koh Chang. There’s also another pool in this area of the resort. ( That’s four pools so far. ) Facilities include all the usual stuff you expect a 4 star resort to have e.g a kid’s club and fitness centre. Buffet breakfast is at The Beach Restaurant – a large restaurant . . right by the beach. The rooms are all well away from the nearest loud bars, but just walk 2 minutes down the beach and you can have your pick of beachfront restaurants and bars at which to dine and down cocktails. The nearest 7-eleven is just outside the car park of the resort. If you want to stay on White Sand Beach, KC Grande should be your first choice if your budget permits. You won’t find anywhere better on this beach. But if the area is too busy or the resort too large try the smaller resorts such as The Chill or Gajapuri Resort both in Kai Bae. Should you stay at KC Grande? Yes. You should stay there. But be aware this is a very large resort and during the busiest times of year – Christmas until late February, it might be too full and crowded for some. It won’t be an ideal place to stay if peace and quiet are a prerequisite. On the flip side, it’s on a great beach; there’s a good range of rooms to suit different budgets and with four pools you can usually find a place to escape screaming kids. And if you can afford it, the beachfront ‘Paradise’ villas are among the best accommodation, in terms of location and amenities, that you’ll find on the island.